I have a plate, that very much looks like the one pictured at your site as an example of "Wa Lee Factory" porcelain. But it is larger (23,5 cm). There are 5 cockerels, the detailes all seems to be better, more detailed and accurate. It has a very pure and even white enamel at the backside, where you can see the brushstrokes. On the front, I can't tell whether there is this white enamel, but the funny thing about it is that if you look at it in strong light and from the side, there seems to be a very vague imprint of another pattern with leaves underneath the motif (flowers and birds) in three of the panels at the rim. I can't tell whether it is a vague imprint, or whether it is some other motif shining vaguely through the white enamel. It has no trace of colour, an it is VERY vague, not intended to be seen, I think. There is no mark. The plate is bought very cheaply at a lokal fleemarked. 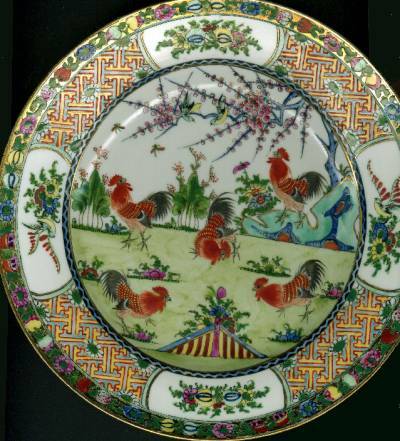 I have seen a few plates with these cockerel pattern on the internet, and they were not terribly expensive (about 70-80 $), so I would not expect anyone to bother making fakes. But is it Wa Lee, and why is there this imprint underneath? This is quite interesting to hear and fits very nicely in with what we know about the Wa Lee factory. This as well as all other Hong Kong enameling studios was relying entirely on white imported porcelain blanks. Most of the porcelain came from China but during the 1960s some was also imported from Japan. Your porcelain piece just seems to have been made with a secret underglaze decoration called "anhua" before the enamels were applied in Hong Kong. It would be quite interesting to se a picture of the piece and its mark if you have to opportunity to send one. Regarding the value I am quite certain all 20th century porcelain sooner or later will become collectors items in their own right, but for the moment and several years to come they will remain very inexpensive possibly with a few exceptions of which this Wa Lee factory is one, since we by now have established its identity.